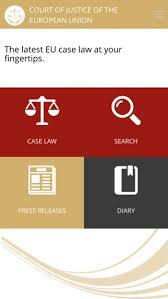 Earlier this month the Court launched its very own app for smartphone and tablet. Available for free in both the Apple App store (for iPhone and iPad) and Google Play (for Android), the app contains a few nice basic functions for us Court followers. ‘Search’: gives easy access to all the case-law of the Court. This section allows searches to be made by case number, parties’ names and date and in full text mode. I have had the app for a week or so now and it is quite a handy basic version of the curia website. The design is also quite neat and it operates smoothly. However, don’t expect too many wonders from the app. The search function is basic, so if you want to search by procedure or subject-matter, you will still need to go to the curia website. Also, while it is great that with one touch you have access to the most recent judgments, the list of judgments does not include the subject-matter of the case. This is of course a general problem with the Court’s website (although half of the list of judgments does indicate the subject-matter) and it makes it a bit more tedious to skim through recent judgments that might potentially be of interest to you. Lastly, it would really be great if the next version of the app would have a notification feature which it unfortunately doesn’t have currently. You can find the app under the name ‘CVRIA’ (with a V not a U) in your app store or in Google Play.